Welcome to the fifth Weekly Briefing, which is publishing one day later than usual due the writer having a really foul cold. Anyway must get on and use the really great material which contributors have sent to me. A coach caught fire on the M40, on the night of March 26th, with 32 children on board. Firefighters from High Wycombe, Beaconsfield and Gerrard’s Cross were called to the northbound carriageway between Loudwater (junction 3) and Handy Cross (junction 4) just after 11pm on Monday night. Fortunately, the 32 children and six adults on board were safely evacuated from the coach before the blaze took hold. Fire crews battled the fire with hose reels, breathing apparatus and a water tanker. We are unaware of which coach company was involved but good news that no one was injured. On the subject of fires another one occurred over the Easter weekend this time at Stansted. Passengers jetting off for a short break to make the most of the long Easter weekend face potential delays because of the blaze. The link below gives more details and pictures. It was one of the Car Park Shuttle buses which was involved, this being one of the Citaro bendi buses and this was totally burnt out in the blaze. Big Ben. The Houses of Parliament. London Bridge. 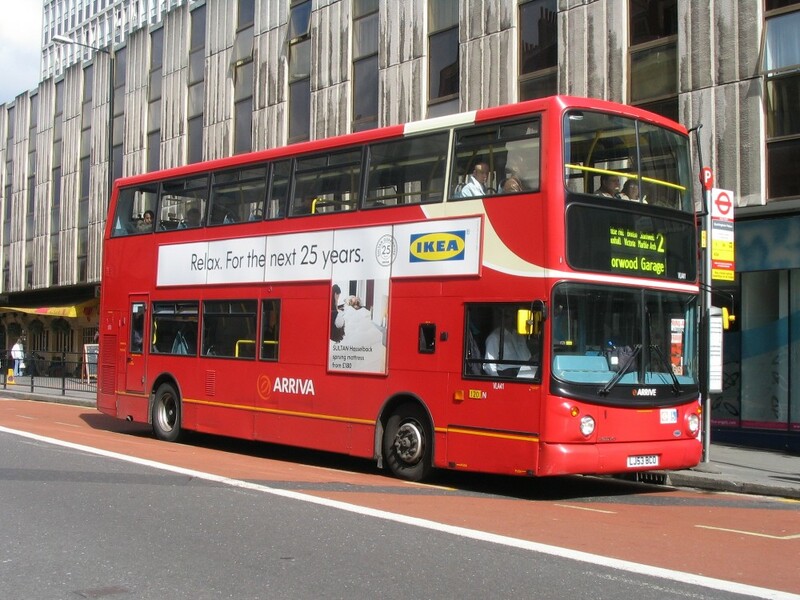 They’re just 3 of around 50 world-famous landmarks on the agenda when you book tickets with megasightseeing.com – our brand new open top London sightseeing bus tour. 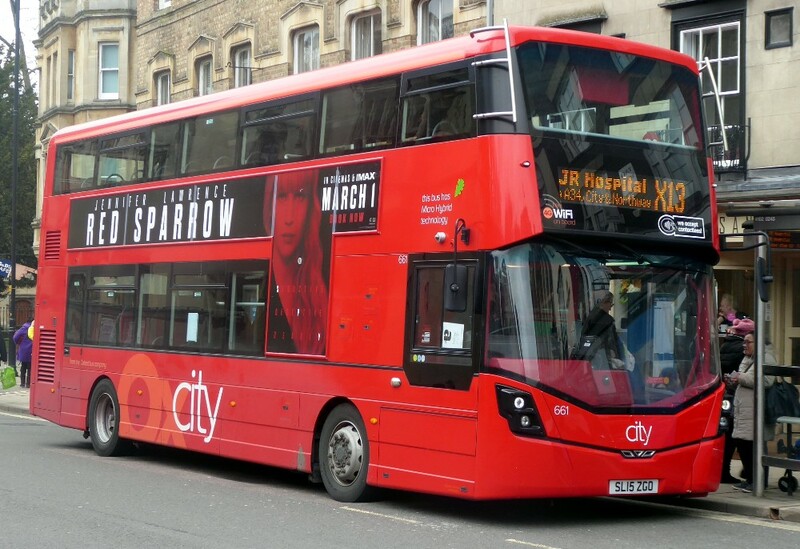 From April 2018, you’ll be able to get onboard one of our open top double decker buses in central London every day of the week, every hour between 10:00 and 17:00. And you can start your tour from three locations: the London Eye, Tower of London and Park Lane. From your chosen pick-up point you’ll be whisked off on a 2-hour, non-stop tour of all the city’s most significant sights. 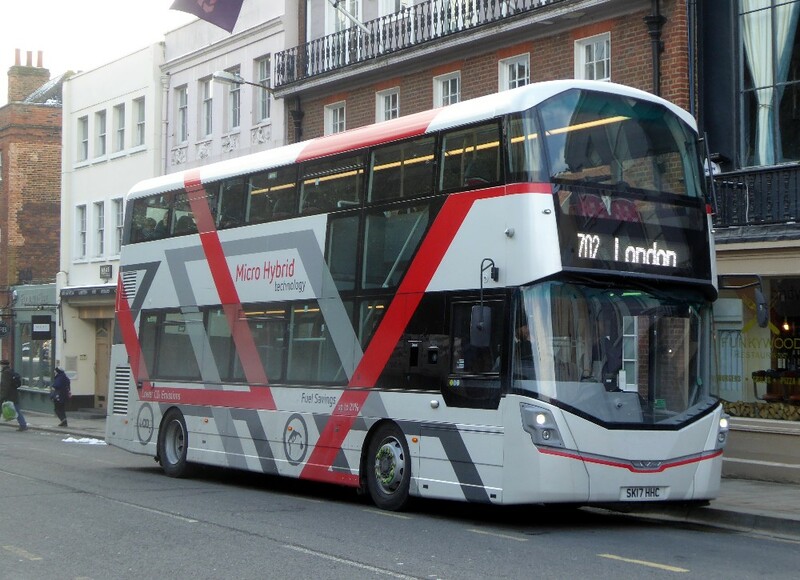 You’ll be guaranteed a seat upstairs on the bus, which means you’ll get a great view as you glide past the Thames, along Whitehall – home to The Cenotaph – and past the centuries-old walls of Westminster Abbey. Plus, thanks to our recorded English commentary, you can learn about the fascinating history of each landmark as you go. Then once you've seen the sights, you'll be dropped back off at where you got on. One of the best bits about megasightseeing.com? The price. Our London sightseeing bus tickets won’t break the bank – prices start from as low as £1 plus a booking fee, subject to availability (so book fast). 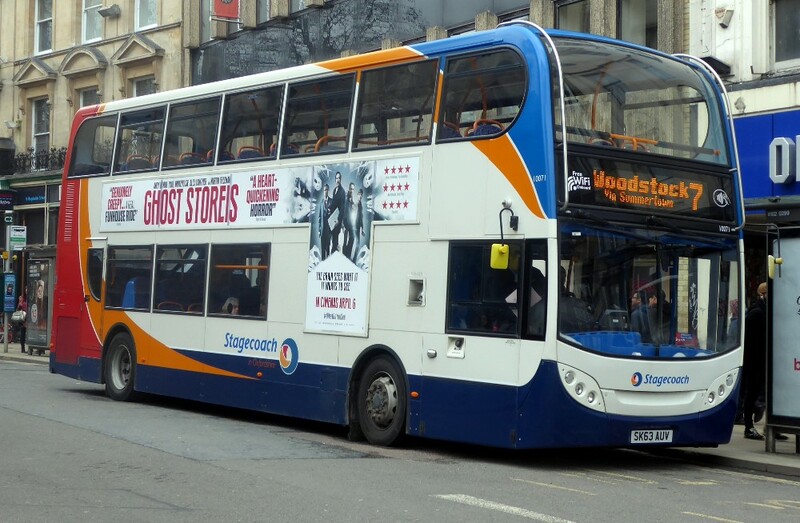 Now, one must wish success to Stagecoach but they join four other open top tour bus operators and one has to ask "can the market stand so much capacity?" Only time will tell. 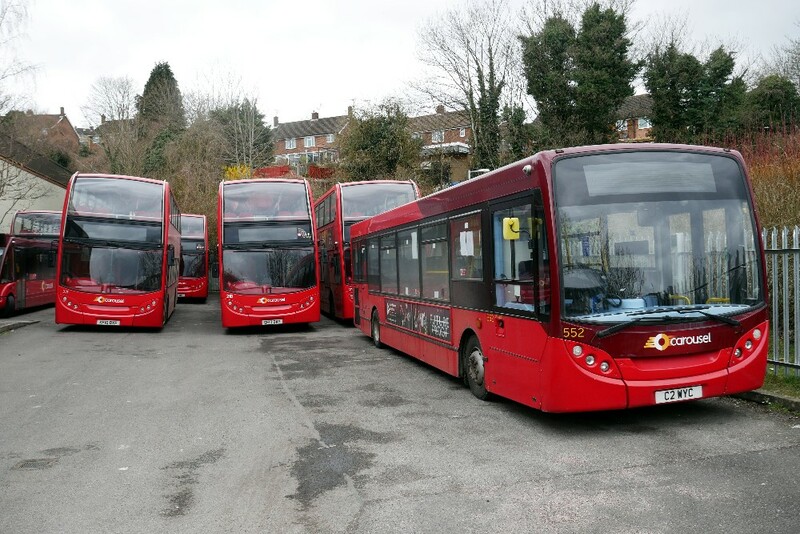 This is an opportunity for pictures of new buses and coaches submitted by readers. One of seven Lucketts/Worthing Coaches new tri-axle Scania Levantes NEx Worthing Coaches XW561256 BK18OSN works the 025 by VCS on April 1st by Paul Hawkins. 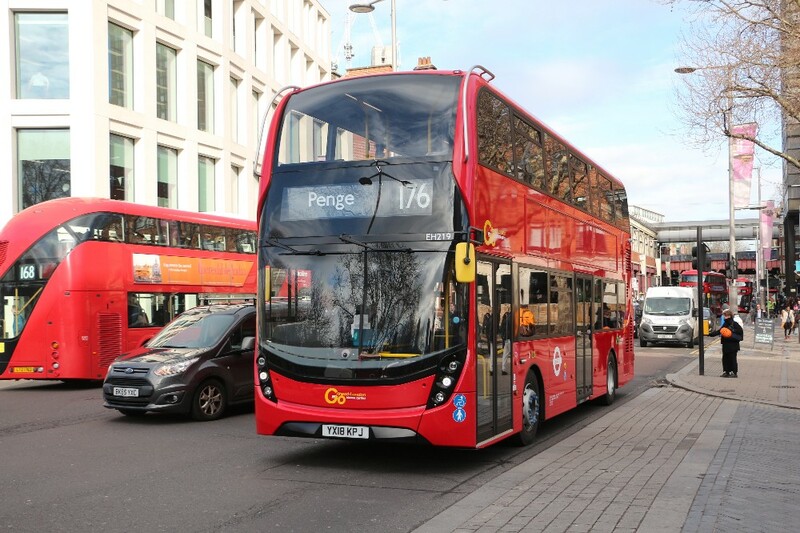 London General have a large fleet of ADL Hybrid MMCs as seen here by EH219 YX18KPJ working the 176 Penge route on April 1st by Paul Hawkins. 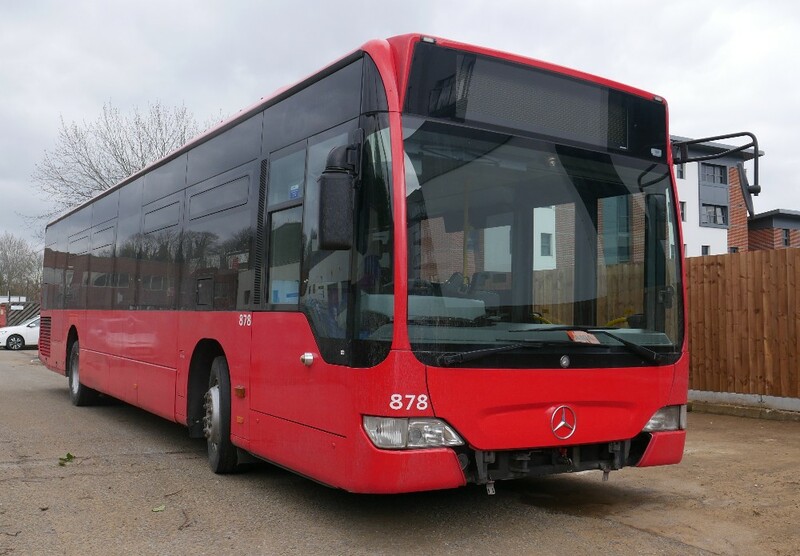 Eva Travel of London own this Mercedes Tourismo BU18YMK seen in Windsor on March 19th by Paul Bateson. Deserving of its own page in this issue is a report from Jack Cooper relating to his week's Work Experience with Stagecoach in Oxfordshire. From the pictures and his report it was obviously a great week and one for the record. Click on the link below. The recent weather in our area has not made the best of conditions for photography but one way and another we have a good page. 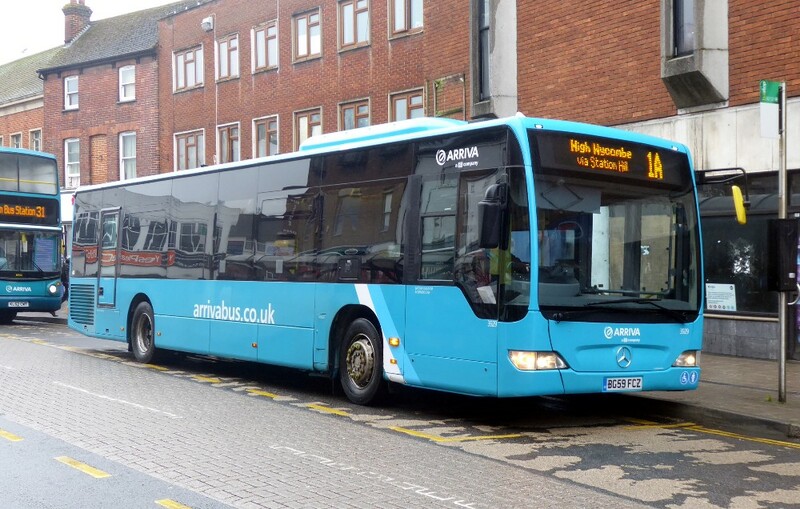 Arriva operated the 35 route from High Wycombe to Bourne End on Sunday 1st and Monday 2nd April, this route normally being operated by Carousel, the 35 service operating Monday to Saturday (Excluding Public Holidays). by Carousel. 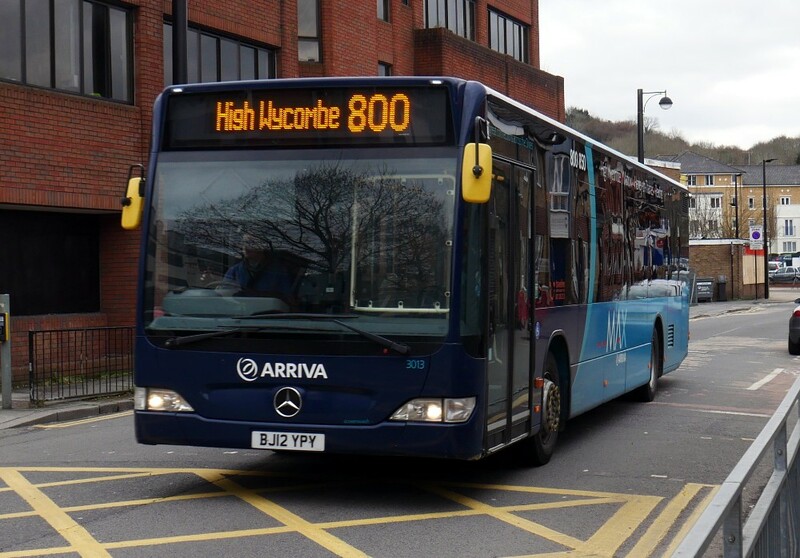 I was lucky enough to be at High Wycombe when the Arriva 1230 service left on Easter Sunday. 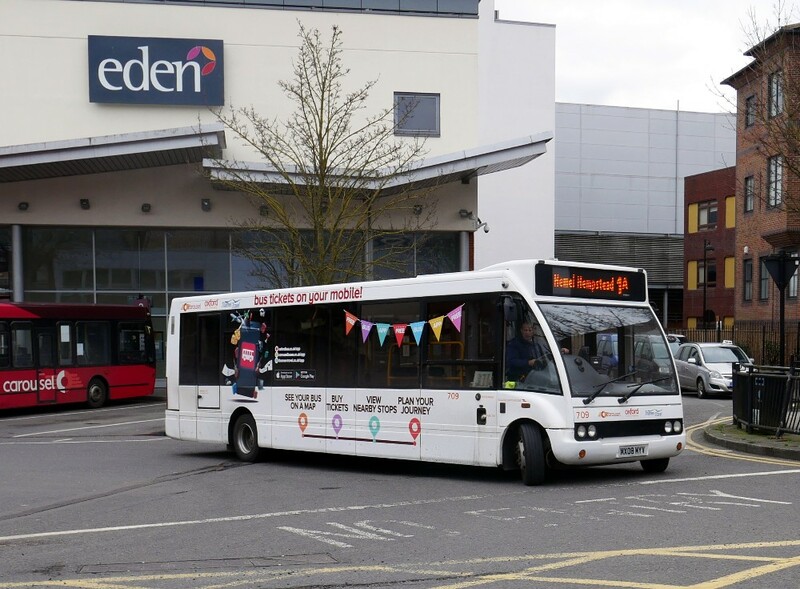 The customers were treated to a nice relatively new ADL MMC, 3109 heading to Bourne End and leaving the Eden Bus Station. 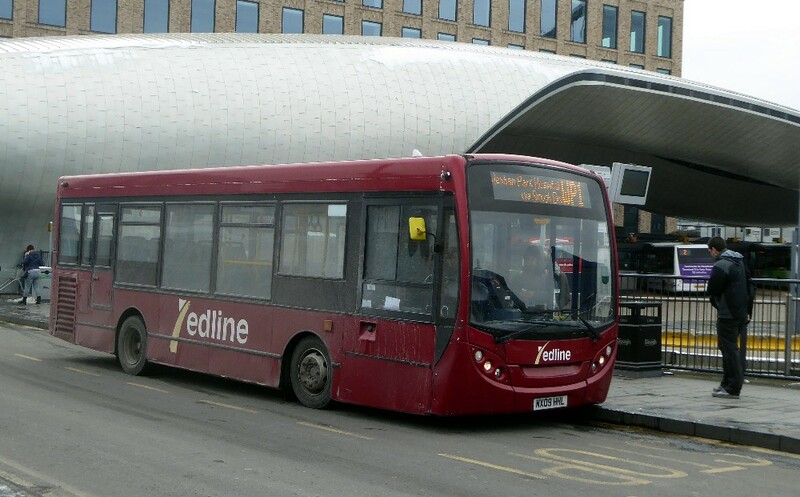 Citaro 3013 with the 800 arriving at the Eden Bus Station from Reading. 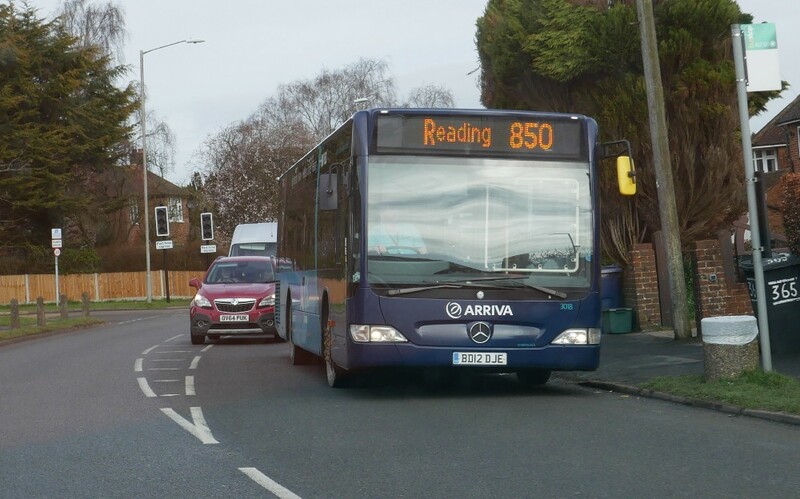 Earlier in the week I had chance to catch another Citaro 3018 with the 850 to Reading heading out of Wycombe on March 29th. 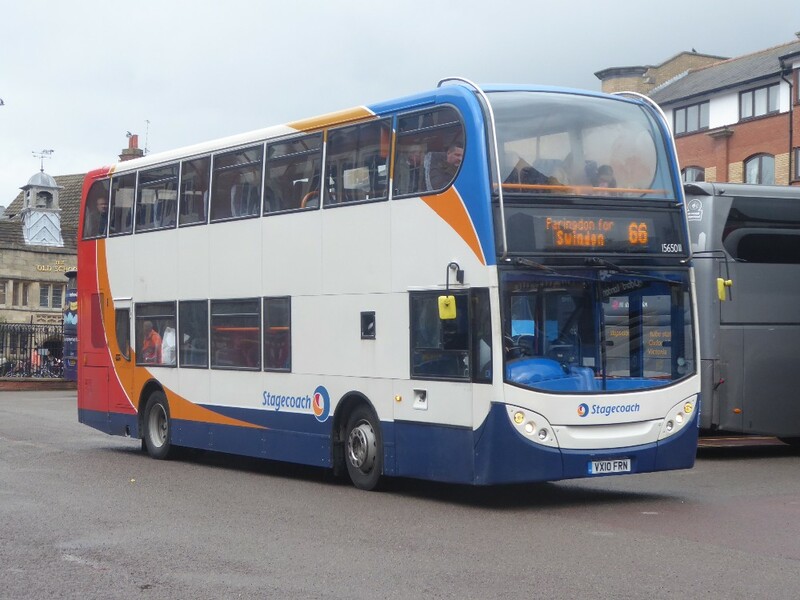 Gavin Francis was in Wycombe and took this picture of 3537, a now elderly DAF SB120 - WrightBus working the 30 in Wycombe on March 27th. 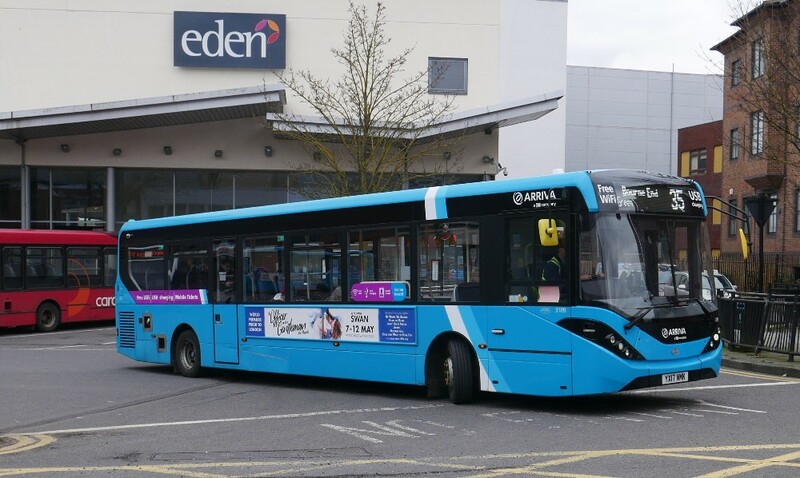 This was part of the ageing Cadet collection with Arriva at MK being ex Arriva London DWL41, later a driver trainer, then Arriva Kent & Surrey and later the Shires at High Wycombe in late 2017. 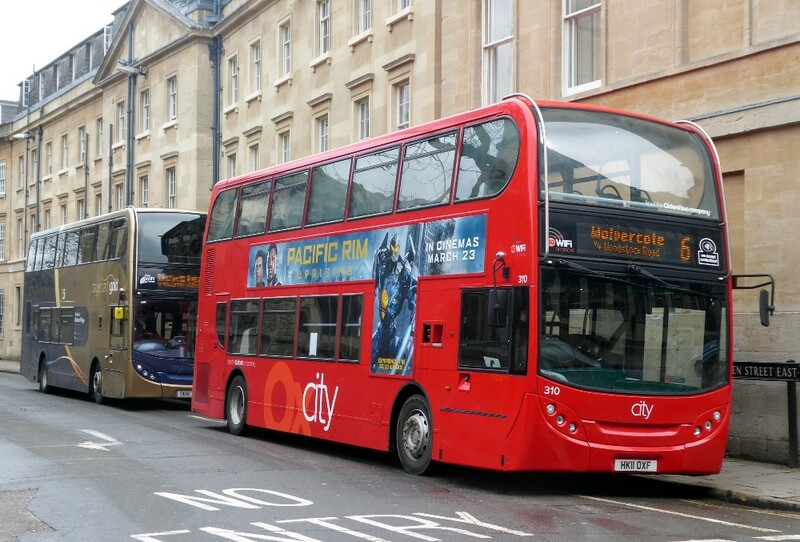 I wonder if this is a float bus used whilst others are away being painted such as this ex MK Citaro shown below. 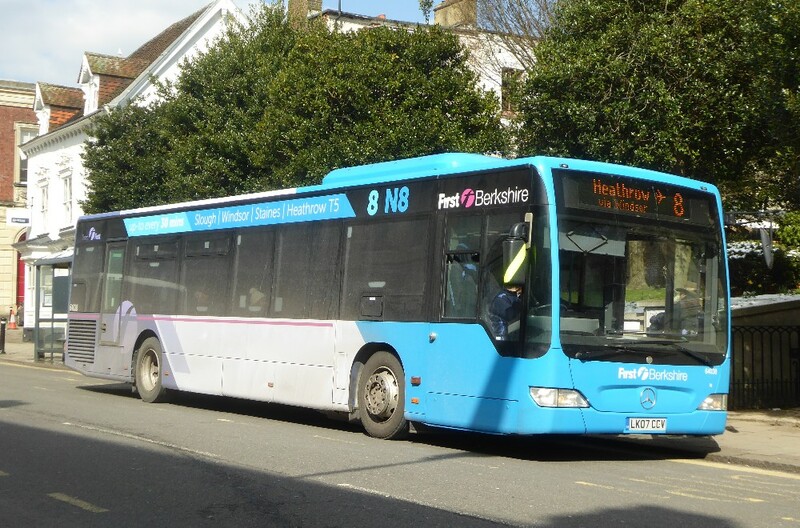 Citaro 3929 seen working the 1A in Wycombe on March 27th by Gavin Francis, came from Milton Keynes in Platinum branding. The operator has a fairly static fleet now with 837 and 838 having departed. One wonders if 878 is also about to depart as it no longer has any branding other than fleet number? I found it looking rather forlorn outside the depot on April 1st looking as if it might have been towed in from an A40 duty. I didn't realise that the 1 goes through to Hemel Hempstead on Sunday as seen by Solo 709 leaving the Eden Bus Station on Sunday, April 1st. Two pictures of the depot on Sunday morning, April 1st with variety on show. 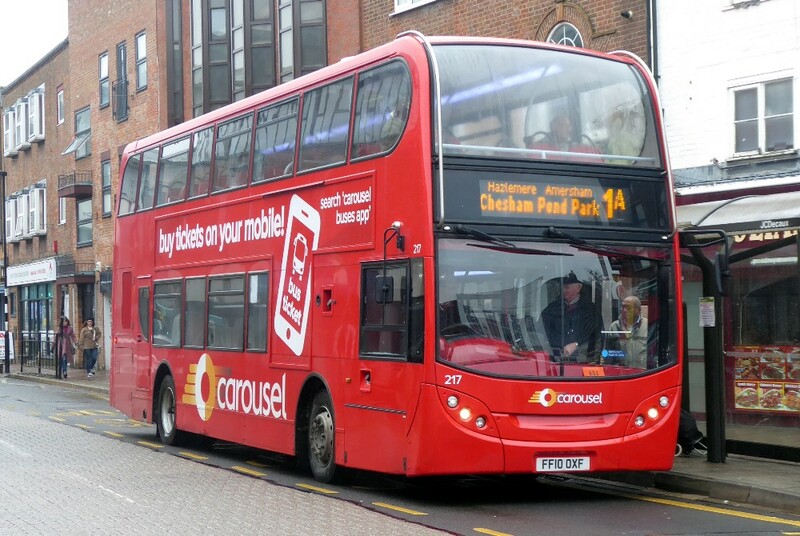 Carousel 217 and then 419 working the 1A from Wycombe to Chesham on March 27th by Gavin Francis. 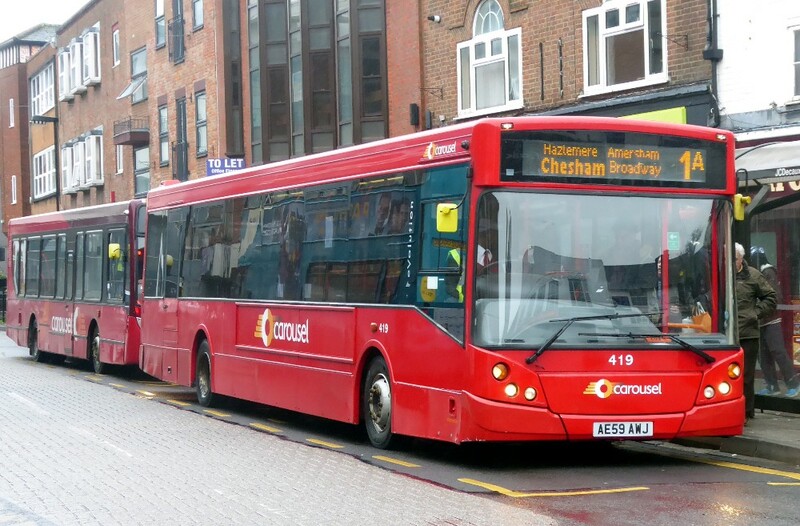 IT seems that the 35 does not always go to Bourne End as seen in this picture by Gavin Francis of 422 to Flackwell Heath only on March 27th. As you will see elsewhere in this issue Paul Bateson has been on a trip over here from Canada. He has provided some interesting pictures taken in Windsor which would seem to be a good photographic destination for the enthusiast when the weather improves. 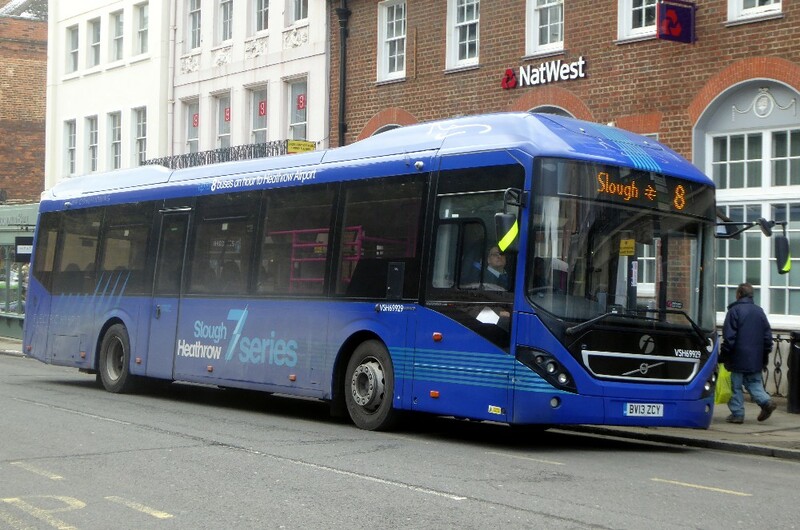 Hybrid VSH69929 BV13ZCY working the 8 in Windsor on March 19th by Paul Bateson. 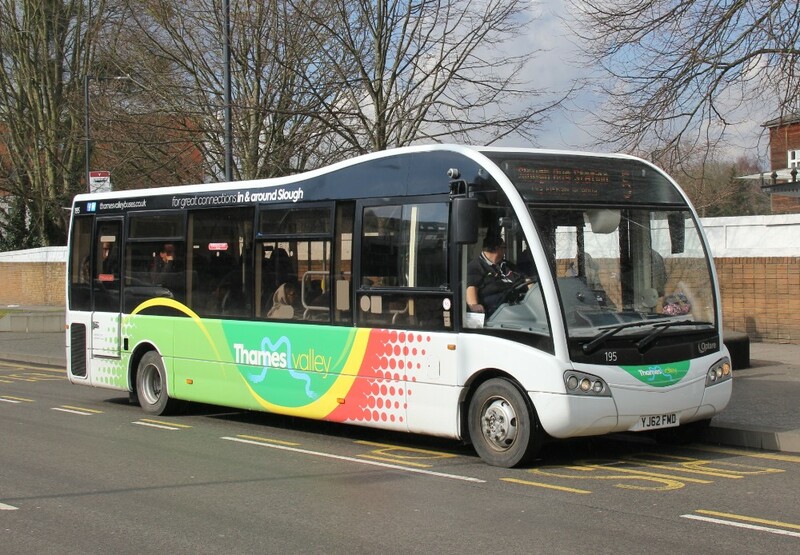 Citaro 64038, route branded for the 8, seen in Windsor on March 19th by Paul Bateson. I noted a High Wycombe based coach on the back of a low loader outside Wycombe High School last Thursday. It seems to be becoming more regular for recovery to be made by low loader these days. 6 road sees a variety of buses and here is Hybrid 310, once the pride of the Park & Ride fleet in Magdalen Street East waiting for its next journey. Picture taken by Gavin Francis on March 30th. Another but later Hybrid, 661, is seen working the X13 (a card) in St Aldates heading for the J R on April 1st by Gavin Francis. A staff car with Oxford Bus, one we've not seen before, is 981 leaving Gloucester Green on March 30th by Gavin Francis. Reading TV 4 at Windsor Parish Church working route 2 on March 8th by Frank Brown. 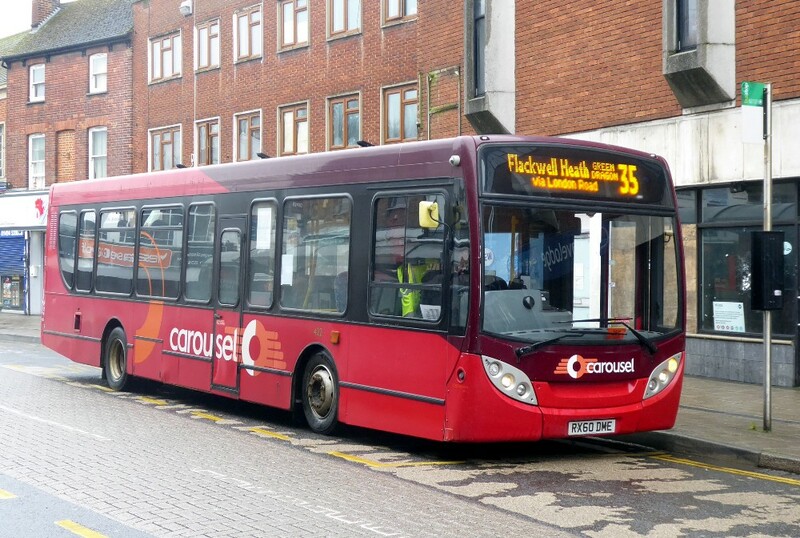 Reading 195 YJ62FMD is one of four ex Courtney Solos acquired for TV route 5 seen on March 8th by Frank Brown. The 702 continues to provide interesting vehicles and I have several interesting pictures. 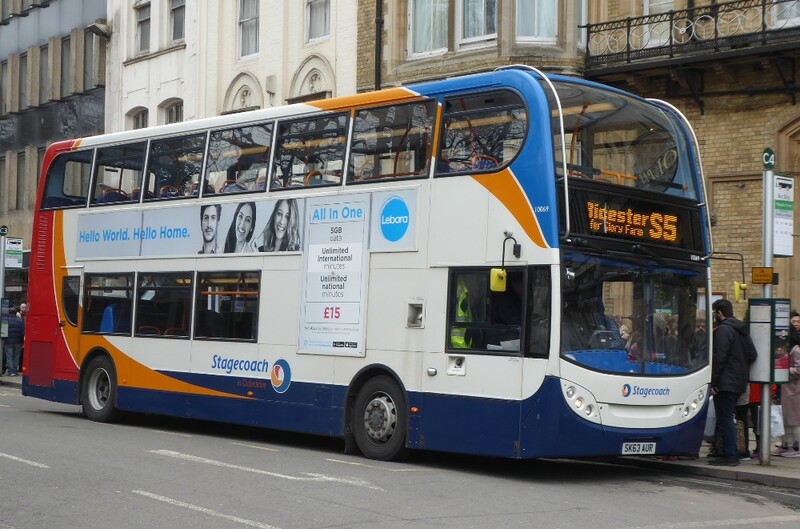 A current performer is this Wrights demonstrator, 900 SK17HHC, working the 702 in Windsor on March 19th by Paul Bateson. 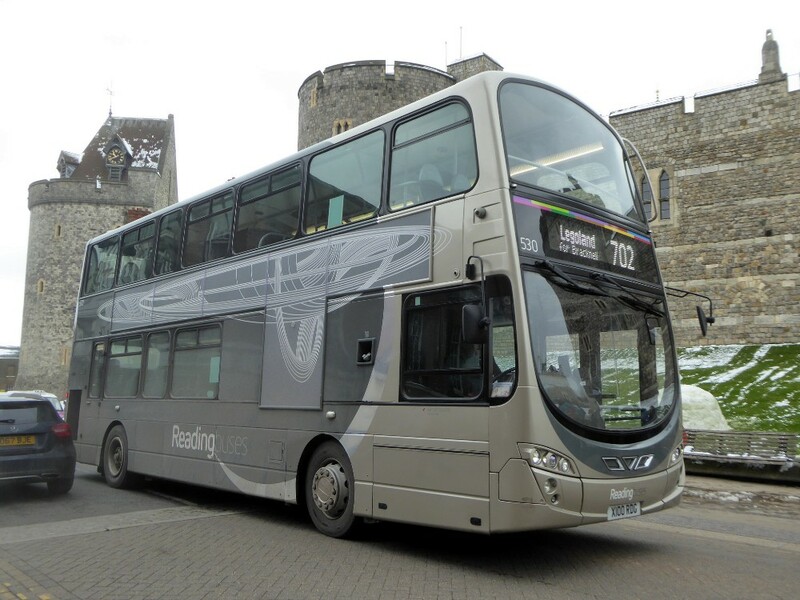 Well disguised of its origins, 530 re-registered X100RDG working the 702 in Windsor is ex Arriva London DW55 LJ04LEU and seen on March 19th by Paul Bateson. Rather surprising is 1203 in jetblack livery working the 702 in Bulleid Way London on April 1st by Gavin Francis. In front of the new Slough Bus Station, E200 MX09HHL works the WP1 to Wexham Park Hospital on March 19th when seen by Paul Bateson. 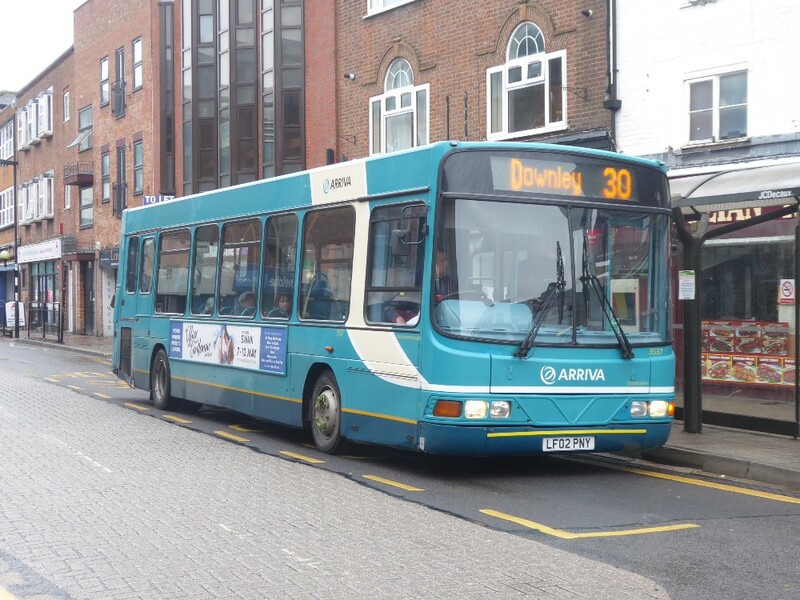 This bus started life with Metro Shuttle in Bolton and for a time was with Arriva 0352 in Arriva's Milton Keynes fleet on a high profile 300 service. 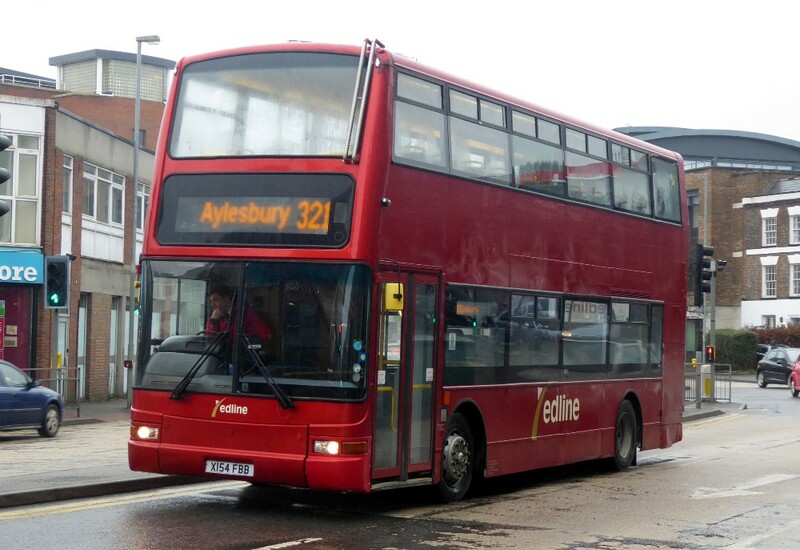 Variety on the 321 sees X154FBB approaching the Eden Bus Station, Wycombe on March 27th by Gavin Francis. This was a regular on the Go Ahead Route 185 as their VP5. Not much to report this week, except that just maybe 10905 is due to return to Gloucester shortly? 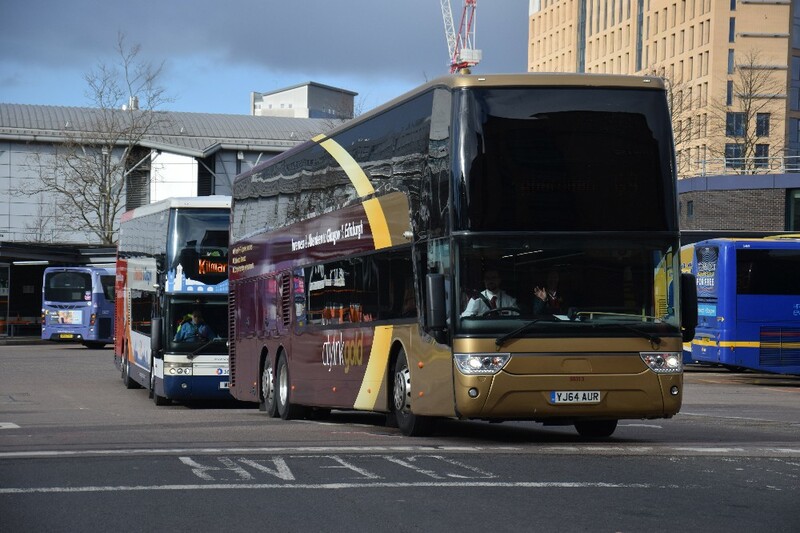 Otherwise the Gold buses seem to have had April Fool's Day off as three Gold services seen had City buses on them! 10069 is working the S5 outside Randolph Hotel on April 1st by Gavin Francis. 10071 works the 7 again near the Randolph Hotel on April 1st by Gavin Francis. Now this is not necessarily a Gold Route but is interworked with buses off the S3. Soon to be released in model form on the route 3, 10684 is seen working the S8 in St Aldates on April 1st by Gavin Francis. on December 27th by Gavin Francis . This bus was not a stranger to Thornhill having been used on the short lived SW1 at the end of 2016. 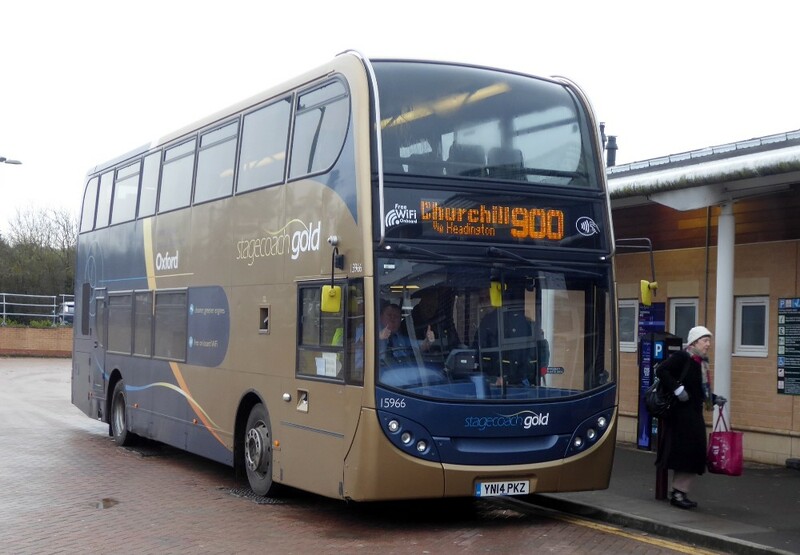 It is seen here working the 900 hospital service which is certainly not a normal place to find a Gold bus! It can sometimes be seen on an Oxford tube relief service in times of need. 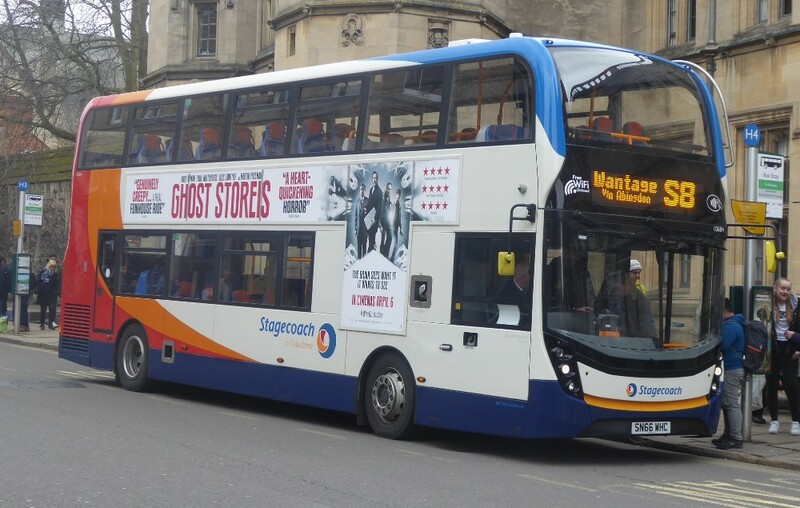 West's 15650 with fresh or repainted appearance with branding for Swindon 49-51 routes removed works the 66 out of Gloucester Green on March 30th by Gavin Francis. Out of our area but sometimes their vehicles can be seen passing through our area. 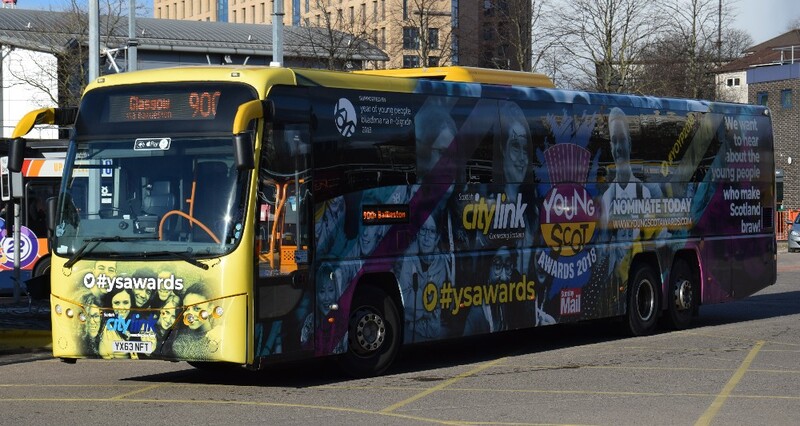 Young Scot Awards 2018 - 54128 YX63NFT seen working the 900 service in Glasgow on March 26th by Gordon Scott. 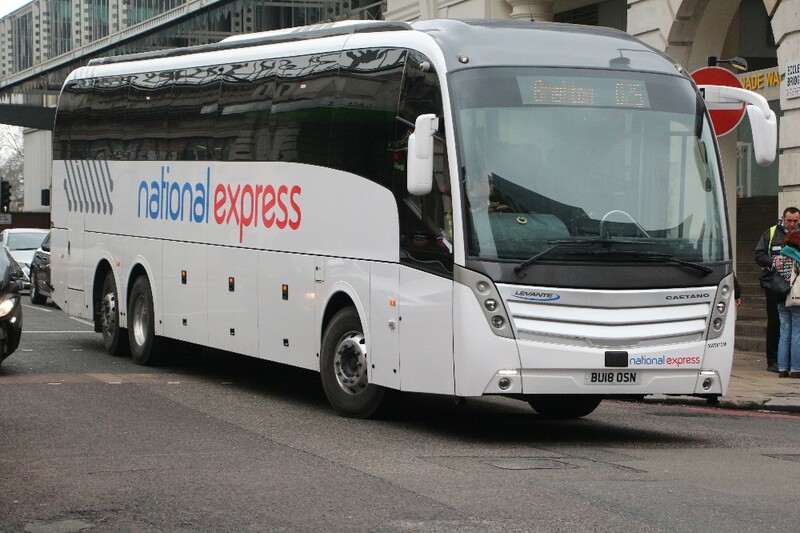 This coach has appeared several times in London on megabus service so keep a look out. An interesting picture as it shows 50313 leaving Glasgow Bus Station with an ex Oxford tube behind it on March 26th by Gordon Scott. 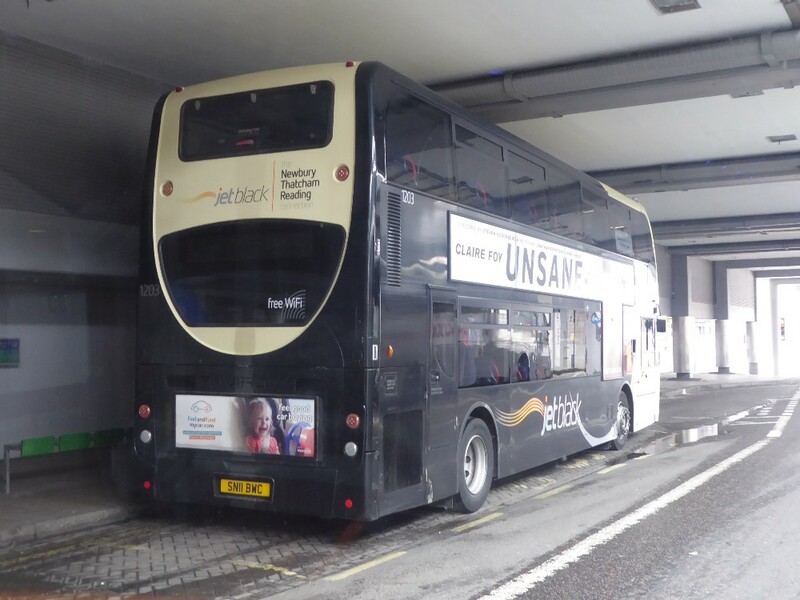 It is on service to Inverness, that is the Citylink Gold coach. 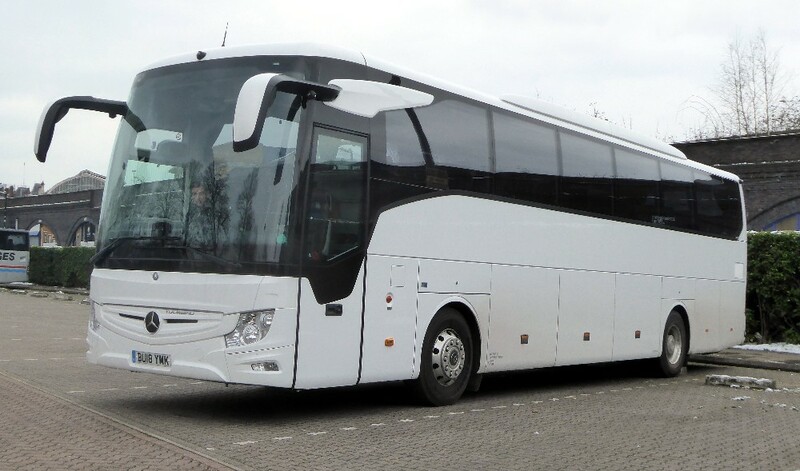 Jim Wright advises that "Swanbrook are operating the lrizar i4 Hybrid coach demonstrator on 853, morning & evening departure from Oxford." 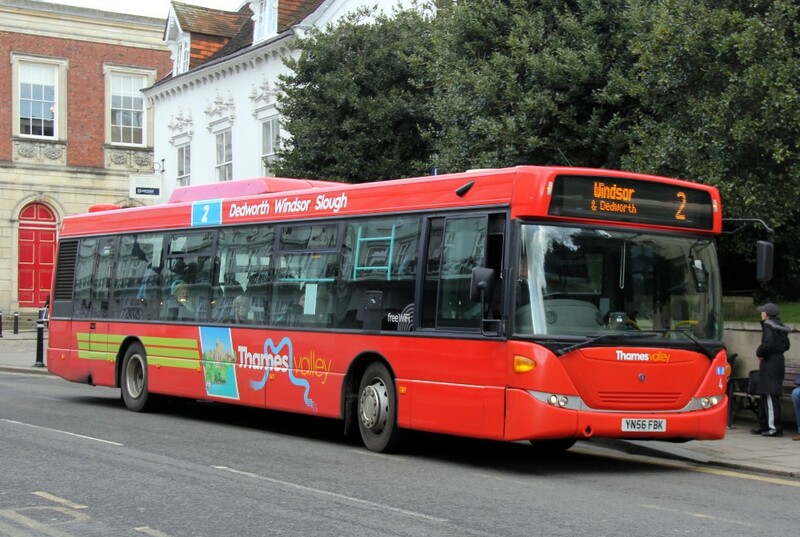 Amun S. Bhomra writes "I noticed in your recent upload that you we discussing the presence of Kennet buses in Abingdon. " YX63ZVR is now Kennetbus ex South Midland. This means all AD Enviro 200 have the Kennetbus branding although I often see them in use near Abingdon. I thought Id get in contact with you to inform you the reason for their presence in Abingdon is they provide school transport at my school. I hope this clears it up?" 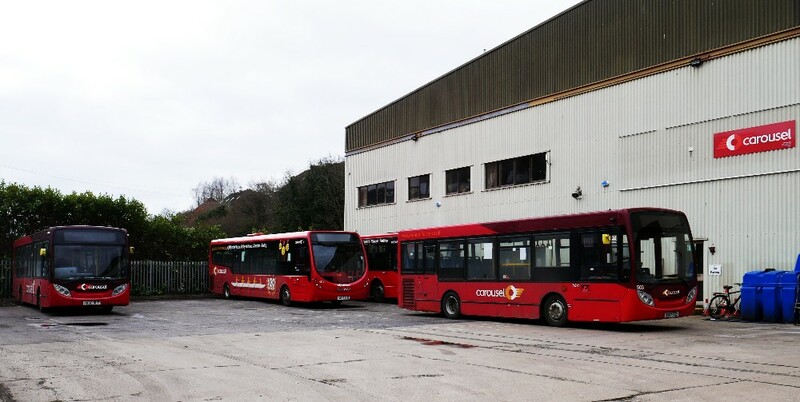 Following on from last week Gavin Francis has provided pictures of the ex Arriva VLAs which have joined the Weavaway school fleet. 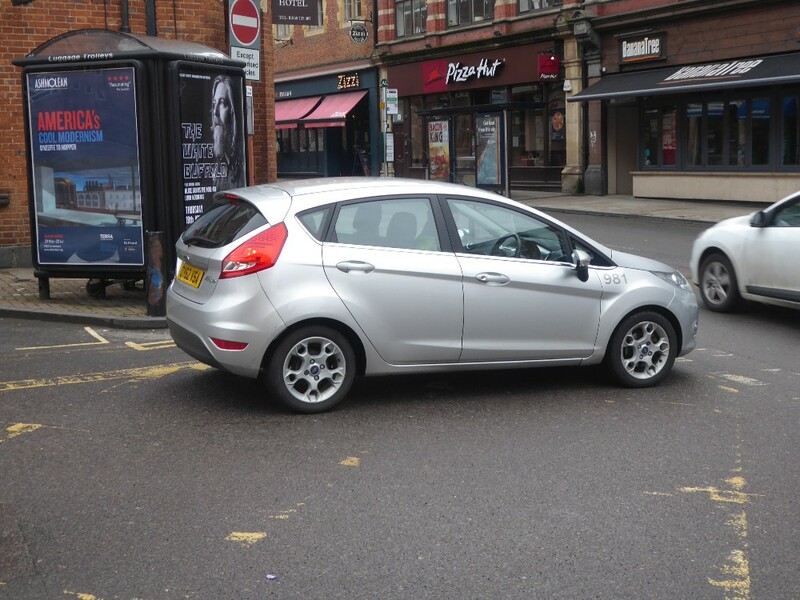 Modifications include three additional tip up seats in the disabled bay and still keeping centre door. Painted bright green with black roof and looking very smart today. No fleet name applied yet but they will by Countywide (hence CW in registration). 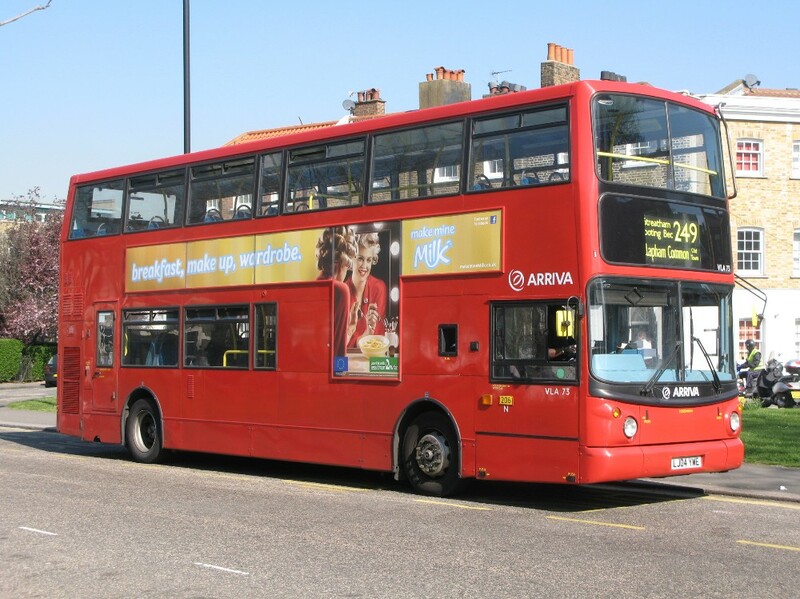 Arriva VLA42 near LAMBETH TOWN HALL on September 12th 2014. This is now CW52TOP. 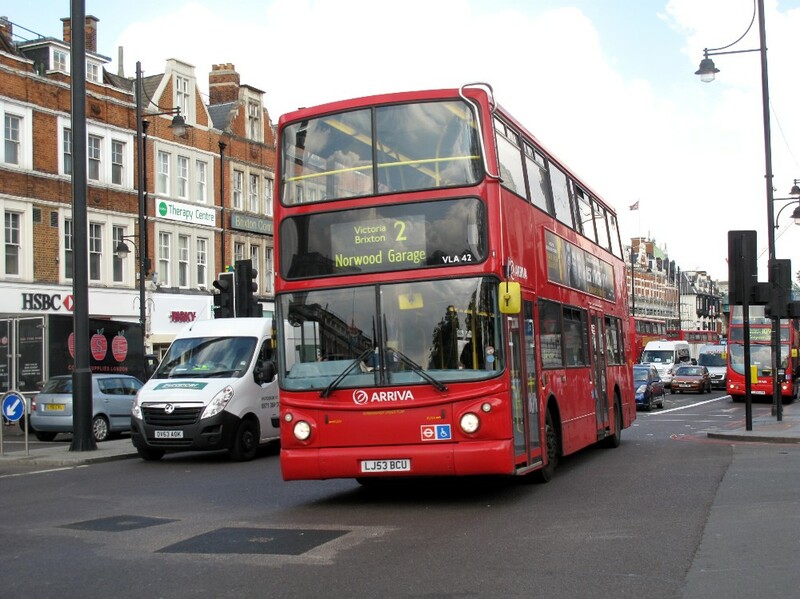 Arriva VLA73 at CLAPHAM COMMON - NORTH SIDE on March 28th 2012. This is now CW53TOP. 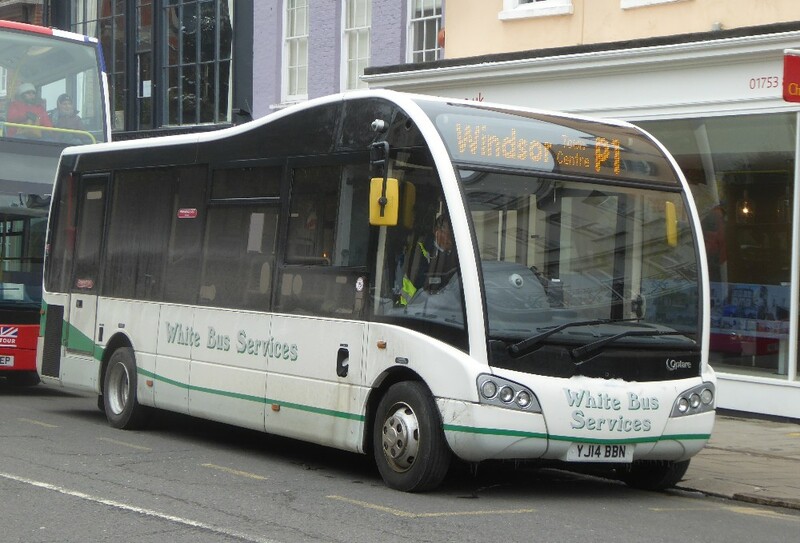 White Bus Services Solo SR YJ14BBN working the P1 in Windsor on March 19th by Paul Bateson.